I have, what shall we call it, a classic film knowledge deficiency. I know a few of the really big ones that I have seen multiple times, but other than that, I'm pretty clueless. Really, I didn't start watching movies or TV until I was in college and after which explains it a bit... It's something I've always kind of wanted to fix, but I have some issues with classic films, sometimes they are corny, or full of sexism, or the special effects are too laughable or the way everyone talks too distracting, etc. So I rely on recommendations for the most part. I also had an aversion to Westerns until I read Lonesome Dove last year, at which point I also allowed myself to start watching some Western films and every time I'm surprised I like them. And finally, when I love an artist or author or TV show I look to their influences so I can be similarly inspired and understand their work better. Andrew Peterson has a great song, one might even call it an Easter song, "High Noon" on his album Love and Thunder. Ding, ding, ding! 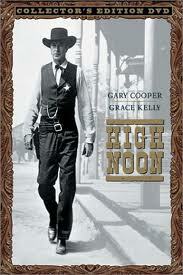 That's why I decided to watch High Noon and was really excited to see it on Netflix Instant Watch. But, I was a little worried that I wouldn't it like it because it's old and a Western. Unfounded fears! I really really enjoyed it. High Noon is the story of a marshal, Will Kane, who just gotten married to his pacifist wife and is hanging up his badge forever, when news comes round that Frank Miller, a man he arrested is coming back to town after inexplicably being pardoned. Will feels he can't leave the town and his unfinished business so he tries to rally the troops to face this threat. His wife is upset and threatens to leave him and his only deputy flees because he can't get his way. The movie basically follows Will around the town as he tries to get support and find people to stand with him in the upcoming gun fight. It takes place in real time and the suspense is very nicely built, the acting is fairly decent, there's mystery and tension in the relationship drama as well, and it's hard not to root for Will Kane, to ponder his motives, to wonder how things will turn out for him. I really enjoyed watching the movie and looked it up afterwards to see what the good old internet had to say about it. It has a really fascinating history! A lot of people didn't like it because it wasn't a typical Western with lots of action, it was considered to be a statement about blacklisting in Hollywood, and apparently it's been a favorite film of several presidents including Bill Clinton. Despite the controversy about it's release and the charge that it's an allegory for blacklisting which roots it in its time, I feel like the movie High Noon still has something to say to us today, about the courage of the individual and standing up for one's convictions, even when the rest of the world is too cowardly to do so. And even the question of pacifism, protection, and love is touched upon a bit. Without examining these ideas, it is, at the very least, an entertaining film. Available on Netflix Instant Watch and recommended! PS Several months ago when I did a reader survey, I asked about the possibility of having a film club where we watch a film each month and discuss it. Is anyone still interested in that? I crave discussion y'all and I need to fill in the gaps of my education!